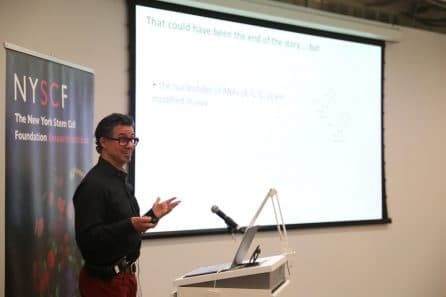 Dr. Tesar (Associate Professor and Director of the Pluripotent Stem Cell Facility at Case Western Reserve School of Medicine) was telling the story of Convelo, the company he created to develop treatments for diseases such as multiple sclerosis. 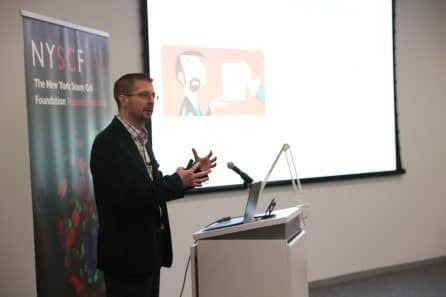 He and fellow NYSCF – Robertson Investigator Alumnus Dr. Derrick Rossi (who previously served on faculty at Harvard Medical School and the university’s Department of Stem Cell and Regenerative Biology) started collaborating on Convelo after meeting at the annual NYSCF Innovator retreat. Dr. Rossi now serves as the company’s CEO. Along with Convelo, Dr. Rossi has been a force behind 3 pioneering startups: Moderna, Magenta Therapeutics, and Intellia Therapeutics, which are working to move treatments out of the lab and into the clinic. At NYSCF’s recent event, “Bringing Stem Cell Science to Patients: The Founding of Moderna, Magenta, Intellia, and Convelo,” Drs. Rossi and Tesar discussed the science behind their startups and their stories of founding and operating a biotech. This event kicked off the NYSCF Seminar Series designed for the scientific and biotech communities. Dr. Rossi began his presentation by telling the story of Moderna, a company focused on harnessing the body’s natural ability to produce therapeutic proteins. Dr. Rossi explains the research that gave rise to Moderna. Moderna does this by leveraging the power of mRNA, molecules that act as instructions that tell cells to produce specific proteins. By allowing the body to naturally produce the proteins missing or dysfunctional in a disease, Moderna’s technology has the potential to treat a variety of conditions for which current drugs are not effective, including cancer, Zika, and heart failure. The company has been highly successful, boasting the highest-ever biotech IPO at $604 million. Dr. Rossi began this work after becoming interested in stem cell science and the process by which cells could be directed into becoming different types. “It’s fun to think about how simply reading a cool paper on pluripotent stem cell science could lead to all of this,” Dr. Rossi remarked. Dr. Rossi’s second company, Magenta, aims to change the paradigm for blood stem cell transplantations. It launched in 2016 after receiving $48.5 million in Series A funding. Magenta seeks to improve the transplantation process by optimizing patient preparation, stem cell harvesting, and engraftment. Their approaches aim to safely deplete a patient’s blood stem cells and immune cells using antibodies prior to transplantation, effectively expand healthy stem cells for transplantation and mobilize these stem cells in the blood, and prevent post-transplant complications with therapies that stop the immune system from attacking the transplanted cells. The idea for Intellia came from the story of the Berlin Patient. CCR5 is a gene that essentially acts as a door into the cell— one that can allow HIV in. The mutation the Berlin Patient acquired in CCR5 through the transplant meant that his cells no longer let the virus enter, effectively curing him. After hearing this story, Dr. Rossi began to think about using the gene editing technology CRISPR to disable CCR5 directly and completed this work in human CD34+ hematopoietic stem cells. Dr. Rossi later founded Intellia to apply gene editing to a broad range of conditions including cancer and other diseases affecting the liver, eyes, muscles, and central nervous system. Intellia closed its first Series A investment round with $15 million in financing led by Atlas Venture and Novartis and is now working toward moving their therapies into clinical trials. Convelo is dedicated to developing treatments for disorders that result in a loss of myelin—the substance that coats our nerve fibers and helps them send signals. Myelin is produced by cells called oligodendrocytes, and when it is damaged in diseases like multiple sclerosis, cells cannot communicate with each other as efficiently. This can lead to symptoms such as numbness, loss of reflexes, uncoordinated movement, and pain. Dr. Tesar gives background on the founding of Convelo. The company builds off of Dr. Tesar’s discoveries in the lab, specifically, his work screening drugs on oligodendrocyte progenitors derived from stem cells of patients with myelin-related disorders. Oligodendrocyte progenitors give rise to oligodendrocytes, the cells responsible for generating myelin, and stimulating their activity could help restore myelin in disorders in which it is lacking. This platform has helped Convelo identify several drug candidates to move toward clinical testing, including several for multiple sclerosis, genetic leukodystrophies, and central nervous system aging and trauma. Dr. Rossi was the first person to encourage Dr. Tesar to turn his research into a company. The two began their collaboration after meeting at the annual NYSCF Innovator Retreat. Convelo got its start by raising $7.8 million in Series A funding from a group of high net worth individuals located in Cleveland, Ohio. Dr. Elizabeth Schwarzbach, Dr. Derrick Rossi, and Dr. Paul Tesar take audience questions. The scientists then took questions from the audience about the advantages of non-VC funding, how Dr. Rossi advised Convelo’s start, and why he left academia to join it. Learn more about upcoming NYSCF events here.